The advantage of our Air-Cruises? You spend less time at sea, more time exploring a choice of spectacular destinations. Take the Classic Antarctic Air-Cruise and fly from Punta Arenas to join your ship in the South Shetland Islands. From there you cruise to the awe-inspiring beauty of the Antarctic Peninsula’s western coast with its monumental icebergs and stunning fjords. Now you also have the option of flying in one direction, to or from Punta Arenas, and cruising in the other – either to or from Ushuaia. It’s your choice. Price representative of 7 nights on board the Sea Adventurer, excluding economy class flights & airport taxes. 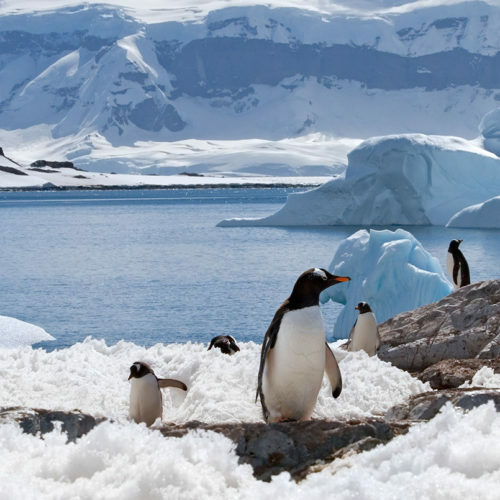 Sail from the South Shetland Islands in search of penguins, seals, whales and the stunning ice world of the Antarctic Peninsula. Cruise back to the South Shetlands Islands for disembarkation and return flights to Punta Arenas. Depart Punta Arenas the next day.